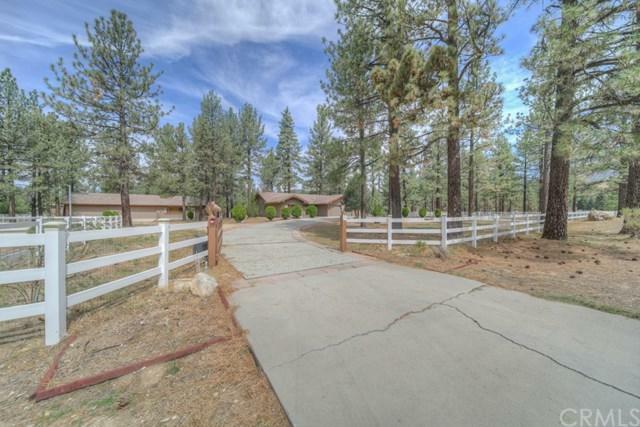 Equestrian dream home, ideally located w/in the picturesque & historic Garner Valley community. Just step outside your gate to access & explore areas long ago traveled by Native Americans & Cowboys, w/ miles & miles of riding trails. The 4.8ac property offers plenty of space for you, your family, horses, and "toys". Don't miss out on this well-built 3 BR, 2+ bathrooms (1-FULL , 1-3/4 , 1- 1/2) in the main home, w/ an attached 2 car garage & view deck looking out to the barn. There is also a separate & spacious 1 BR guest house, including roomy kitchen & dining area, spacious LR, 3/4 BA + 2 add+GGl, 2-car oversized garages. The incredible 5 stall wood barn includes oversized, heated stalls, 1 of which is a foaling stall w/an observation window located in the large tack room next to it. The property is ideally set up w/ 2 add+GGl LG fenced turnouts. The white vinyl fenced property w/ perimeter critter fencing, includes orchard & dog runs. Much of the home and guest house were recently updated w/newer roofs on both of the homes and the barn. Garner Valley includes 26 miles of maintained riding trails, and endless miles of trails within the surrounding National Forest areas.This is a truly spectacular setting nestled w/ in a small forest of pine trees w/ a mild 4 season climate, encouraging a healthy & active lifestyle. This wonderful property is convenient to Temecula's Wine Country, the Desert's "El Paseo" famous shopping & dining, & the quaint mountain town of Idyllwild! Sold by Jaime Duenas of Century 21 Citrus Realty Inc.